Our Business - Matsumoto Trading Co.,Ltd. With a deep understanding of our customers’ needs, we offer new ingredients, the latest information, and technologies for not only new product development by our customers but also improvement of current products. Cosmetics is our core business, which accounts for nearly 80% of sale. 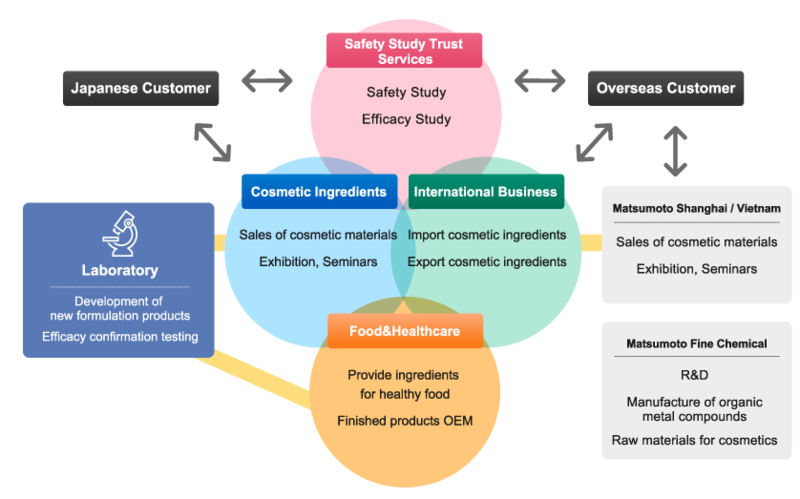 Matsumoto Trading plays a vital role in the cosmetic circle here in Japan, by providing them with not only quality ingredients but also related services and information. Matsumoto enjoys a good reputation here as a dependable supplier, which has been cultivated through the longevity since 1663.